While the main range of Croky's range have designs that are interestingly youthful and modern, with their little Croky bird and it's speech bubble, the cartoon style of writing and imagery is less evident with their 'Natural' offering. The logo is still prominent, but the elderly man in vintage clothing in his retro grocery type store, not to mention the brown bag impression, provides a forceful traditional feel about what you might find inside the bag. 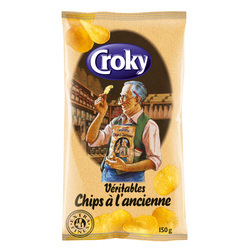 These Chips had a crispy crackling type crunch initially. It was not hard and firm, but the Chips did munch fully after about three or four munches. These left a mouthful of small pieces that then turned mushy. These were really quite beautiful looking Potato Chips. They were curly wurly like Kettle Chips. They were just the right thickness. They had been blanched sufficiently to make the colouring a perfect light yellow. There was no seasoning visible. There was no other colouring visible. There were no real oil boils, which obviously limited the positives in the texture category, but that did not overwhelm the pretty uniformity of the Chips. A Nose Plunge Test revealed no aroma at all – were there Chips in there? A peak confirmed their presence. There was a mildly salty potato flavor that was not exactly enhanced by rather tasteless oil, but the Chips were very much as described on the bag. Traditional and 'Naturel'.